Sample secretarial interview questions frequently asked by interviewers. The interview answer guidelines will help you prepare your best answers to land the secretary job you want. However, this is a good sample of the interview questions that are most commonly asked in secretarial recruitment. Describe how your work experience relates to this job. What software packages are you proficient in? What sort of documents have you produced on Excel? Detail your knowledge of Excel. Relate your data management skills to the job requirements. Use examples of the functions you are familiar with such as creating, modifying and formatting spreadsheets to support your proficiency level. Be detailed and demonstrate your familiarity with the functions. "I performed tasks such as creating and editing tables, columns and charts as well as sorting table data and performing calculations in tables. I created and formatted forms ......."
What experience do you have with planning meetings? Detail the actions you have taken to set up and co-ordinate meetings such as organizing the venue and times, informing participants, preparing agendas and organizing documentation. Go on to describe your experience in taking minutes, typing them up and distributing them. This is another opportunity to provide a work sample. Focus on your organizational and planning skills in answering secretarial interview questions like this. Describe how you handled your manager's work schedule. Detail how you kept yourself informed and up to date with your manager's commitments and co-ordinated his or her appointments and meetings. What systems did you use to manage schedules and calendars? How did you follow up? One of the key secretarial interview questions. Explain how you schedule and prioritize your tasks and activities appropriately. How do you decide which are the most important tasks? Focus on key aspects like finding out the urgency of the task, determining deadlines, working out how long the task will take and setting realistic targets for yourself. When do you develop your list of activities to be completed - at the start of the day or before you go home ready for the next day? How do you reshuffle your priorities as situations arise that demand a change in your priorities? Detail the types of correspondence you were responsible for with the focus on your written communication skills, accuracy, spelling and grammar ability. Highlight the level of responsibility you were given - reports, letters, memos etc. Refer to the methods you used to send and distribute correspondence. Secretaries and administrative professionals are expected to have excellent communication and interpersonal skills. Describe the type of interactions you had with colleagues, management and clients. Highlight how you used your knowledge of the department, organization and business to respond efficiently to these queries. Confidentiality and discretion are key skills for a secretary. 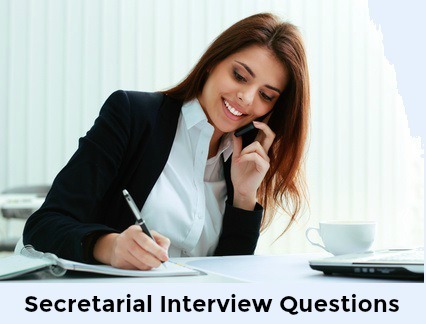 Expect secretarial interview questions that explore your ability to handle confidential information. Detail the sort of sensitive information you had access to. Explain how you made sure the information was kept confidential. How was the information stored and destroyed? Explain what types of transactions you handled - check, cash, bankcard - and what procedures you used to process and document these. How much money was involved? Focus on accuracy in terms of collection, receipting, reconciliations and banking. Tell me about the manager/s you worked for? When answering secretarial interview questions about previous managers avoid saying anything that can be seen as negative. It sends up a red flag about your attitude to authority and supervision. Find positive aspects to highlight. Focus on the areas in which you worked well together. Find sample answers to the question How would you describe your previous manager? 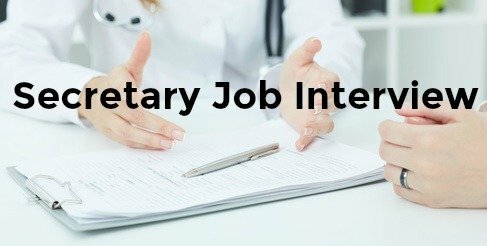 Be ready for the secretary interview questions that explore your competency and motivation for the job. Prepare your own winning answers using the sample answer guidelines. The job interview is a two way process - you will be expected to ask questions throughout. Have a list of smart and insightful questions ready to ask the employer and impress as a committed and confident job candidate. This list of questions to ask sets you up for success.